Up early, and down to meet up with Matt and Richard and headed for the train station for breakfast. It was a Bank Holiday, so most shops were shut but cafes were still open, so we had coffee and pastries and watched the city wake up. The weather was cloudy but quite mild, and wandered over to the road where the coaches that had been organised to take us to the venue were laid on. 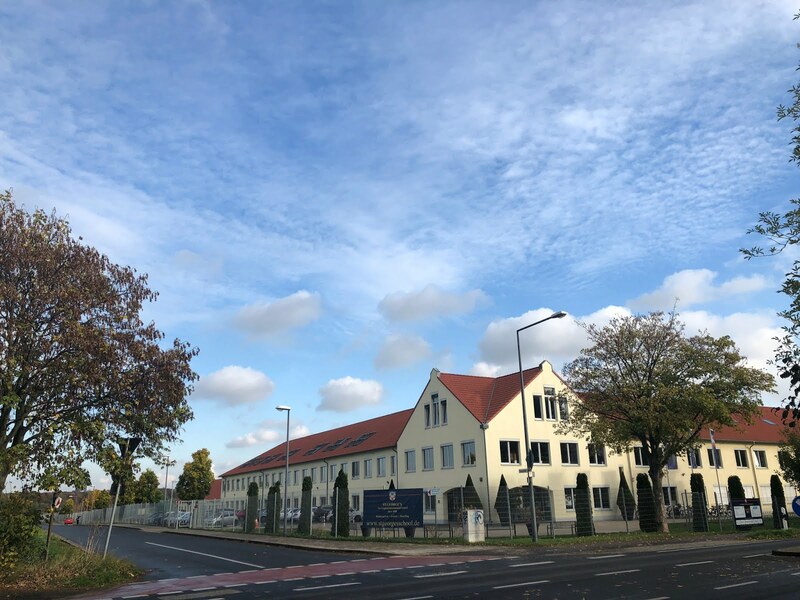 We arrived at St. George's International School of Cologne, and went in for refreshments and to start the first of many conversations that would sustain us and keep going over the next few days. There was endless coffee, juice and biscuits. There was an area for exhibitors and one for the keynotes. The morning keynote on the first day was given by Hywel Roberts. I have Hywel's book 'Oops' and had heard good things from those who had seen him speak before. I know that Russel was looking for a contrast to Ewan McIntosh, who had been to the first two conferences, and did a great job in Toulouse two years earlier. He was introduced by Russel Tarr, who had organised the event once again. The keynote was a series of stories of encounters in classrooms; a reverie about the power of the imagination, and the importance of stories to draw student in, and take them to the point where they feel they have invested in it, and suspend disbelief. He talked about the area where he worked, and the influence of working with Dorothy Heathcote. He described how he knew that one lesson was working: “because Billy stayed”. I liked his description of ‘meerkat children’: the ones who notice things first: the dog outside the window, the wasp etc. The importance of going deeper was something that he kept referring to, along with the importance of moving away from the possibility of an enforced / monetised curriculum. I would imagine some of the delegates may have wanted some more 'content', but for me Hywel struck the right note at the start of a two day opportunity to go as deep as you wanted into research and other things. 'The Old Factory' was a context for thinking which he took us into. I was reminded of Noel Jenkins work on the changes in his own town, with fake planning documents, and the transformation of an old factory into a climbing wall. I liked his way of shaping questions and encouraging students. The phrase ‘protected in’ was also introduced - something that he returned to later. I also liked the way that he described the different ways that what he called a 'warm school' and a 'cold school' would approach the topic of 'The Vikings'. I really enjoyed Hywel's talk, and had the chance to speak to him during the conference as well. 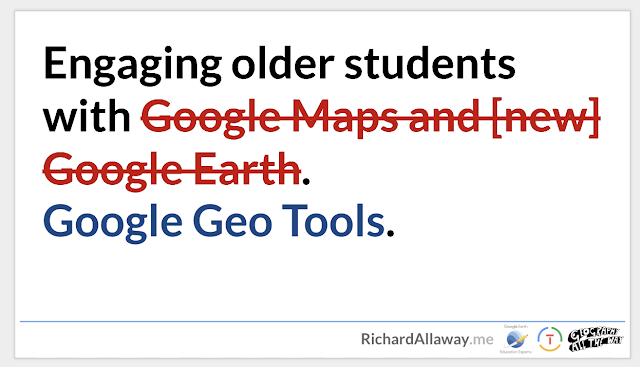 I started the formal part of the day with Richard Allaway's session on GeoTools. The presentation is available to view by following the link above. Richard also gave away stickers... which are essential of course. I spent an hour finalising my presentation for the day after, and then had lunch, and got myself set up for the afternoon sessions.